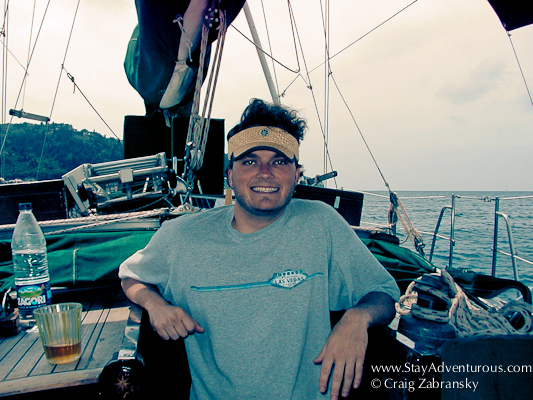 Sailing the Greek Islands was the trip that truly set Stay Adventurous in motion. Below are the words I penned (or typed actually) as my first ever published travel story describing the trip. The site where it was published years ago, realhoboken, is no longer live, so I took the liberty to add the story here. In some ways, I think this is where it belongs. Summer vacation equals the shore and the beach, right? You take long weekends to enjoy Sunday nights at the beach, or even stretch the midweek 4th of July day-off into a full week off. And who could blame you? You have limited vacation days and access to a shore house. I felt the same way until last summer (2004). 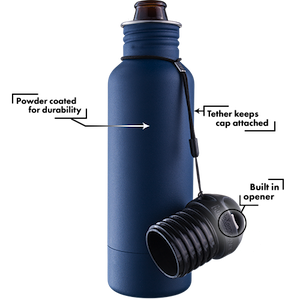 I always loved to travel, but I would strategically plan my trips for late spring or early fall this way I wouldn’t miss a day surfing and tasting the good life at the shore. However last year all that changed…I hungered for adventure. Only a 1⁄2 share in a beach house, I decided to accept an international wedding invitation and visit Greece. With my girlfriend an eager participant, we were off on a 17-day trek. The first stop was Athens. Even although most people advised me not to spend any time there, (saying that Greece’s real beauty is on the islands, and yes I agree,) I still decided to spend a few days. Athens was dirty, congested, and widely under construction for the Olympics. But to me all cities have a charm, and as a student of history, the charm of Athens was more than its food, it was walking amongst ancient history. We visited the Parthenon, the icon of Athens. 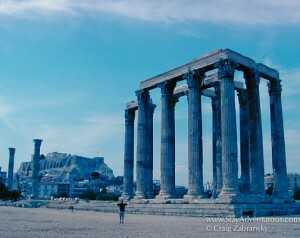 Next, and in my opinion even more impressive, was a walk around the remaining, towering columns of the Temple of Zeus. Still today I marvel, as do most, that such massive structures were completed over two thousand years ago. Quenching our historical thirst by the third day in Athens, we were off to an even greater adventure sailing among Greece’s Ionian Islands. We flew to our rendezvous point, Corfu, a day early to enjoy the island before meeting our charter a short ferry ride away. Corfu, and as I would later discover all of the Ionian Islands, was heavily influenced by its days under Venetian rule. The narrow winding streets lined with quaint homes and shops made walking through town a joy. Even the day’s drizzle could not dissipate the lovely aroma produced by the numerous balconies blooming with flowers. By nightfall the rain thankfully subsided and we met our travel companions for dinner – ‘thirtysomethings’ from LA. Together we tasted the first of many glasses of ouzo and looked forward to the adventure ahead. 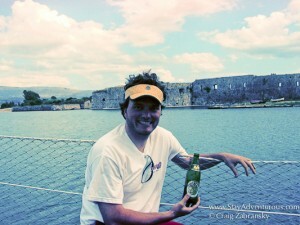 The next morning, we took a ferry to Paxi and met our ship’s captain, Tristram, and first mate, chef Paolo. They introduced us to The Elentari, our sailboat – a beautiful wooden ship, completely custom built by the Tristram’s father for his ’round the world (RTW) adventures. The boat had all we needed for a week long stay, including comfortable accommodations, daily breakfast and lunch and all the wine and beer you could drink, which tended to be quite a lot at times. Dinner was not included, but we discovered that we would dock each night in a new port just after sunset on the Ionian Sea where we would have no trouble finding a friendly local taverna. 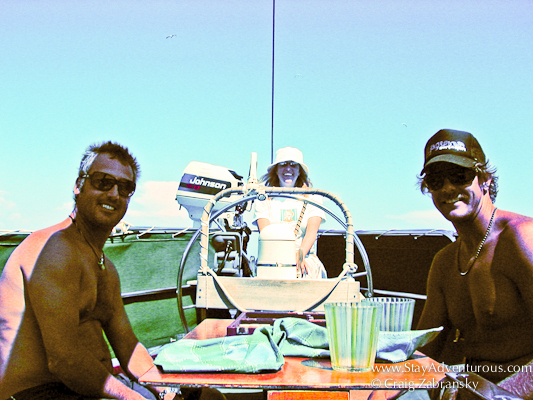 That day began a life-changing adventure sailing the Greek Isles. 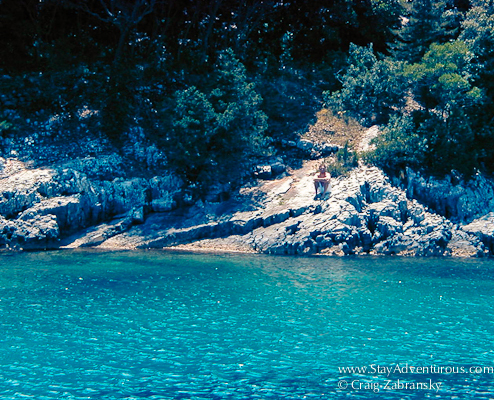 Along our travels, we would sail from island to island – stopping at Anti-Paxi, Lefkada, Ithaki, and Keflonia. The route depended on the weather, the winds, and honestly how hung-over we were from the previous night. We had a few long journeys between islands, sailing fast at speeds of ten knots, bemused with the occasional school of dolphins swimming in our wake. When the winds proved difficult, we took short trips, tacking along the way with Captain teaching those willing how to really sail. For others, such as myself, I just simply relaxed on the deck, enjoyed the scenery and worked on my tan drink in hand. Great food, friends and sailing aside, it was the island scenery that really made the trip. Every moment we were met with breath taking views of clear blue waters matched against steep cliffs covered with lush vegetation. We anchored off white sand beaches, swimming or snorkeling in the crystal clear waters, reading or napping in the ship’s hammock, playing the Greek game of backgammon, and of course consuming Mythos, the local beer. On one particular day, I had just returned to the boat from a coastline exploration. Suddenly out of nowhere, a tourist boat descended on the cave I had just spent a 1⁄2 hour exploring. All the tourists jumped into the water and splashed around before a loud horn sounded signaling them to return to the boat. The once tranquil cave where I had pondered my escape from the grips of corporate America became a frenzy of tourist activity. As the tourist boat left, it powered rather close to the Elentari. I noticed many of the passengers where still taking photographs. However, the pictures were not of the cave nor of the landscape, but of the Elentari. At that moment it was evident that I had chosen the proper way to appreciate this part of the world. Sailing the Greek islands is a once in a lifetime trip. They say that a trip to Greece changes your life. “They” are right. The change inspired for me was finally taking a sabbatical from the corporate world to experience the real world. 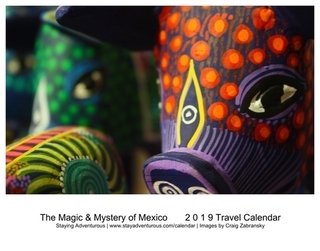 Now two-thirds through (when published in 2005) with my adventures, I hope to write timely pieces for you, the reader to inspire your own life-changing adventures. My original title to this was, Greece can change your life. And now 8 years later, I am living proof not only can it, but it does. This is also part of my European Summer Series. And the photos may seem vintage, well they are if you consider a ten year old digital camera vintage. This sounds like the perfect way to see Greece. You’ve definitely inspired me to do the same at some point. Glad you took the opportunity to go! definitely a great way to see Greece… and I imagine any nation of islands. hopefully your world wandering shall take you there, I definitely recommend it. Greece is high on my priority list of places to travel. The water looks stunning and I have only heard good things about the country. We look forward to seeing how Greece changes our lives. It’s a great spot and definitely changed my life… hopefully you get there soon. You must. It’s a must, and I don’t say those words often. It’s really so cool that you have this piece to look back on. My how things have changed in your life (for the better, I’m presuming). I really want to do Greece, and like you, wouldn’t skip Athens. I think it a crying shame not to give that history at least a couple of days. Well done! Leah, yes for the better… definitely for the better. And absolutely agree, Athens deserves a few days… the history is incredible and so was the food. completely agree that you can’t skip athens! the hubs proposed in santorini, so greece is near & dear to my heart. It definitely changed your life too… great to hear it. love this Craig. i went to Greece for the first time in September 2011 and am dying to get back. i agree, you do often hear that Athens isn’t worth the stop but, like you, i disagree. i think seeing the Acropolis was one of the most amazing and inspiring things ever. can’t wait to see what else you put in your Euro Summer Series. i’ll be waiting! Lola, we were there at the same time!! Thanks Lola… so glad to hear you say that about Athens too. The Acropolis was exactly as you state – inspiring. the series continues later today…. I thought Athens was quite worthwhile a stop! It is an incredible place. I have only seen Mykonos and now, reading this, I want to see ALL the islands around the country! 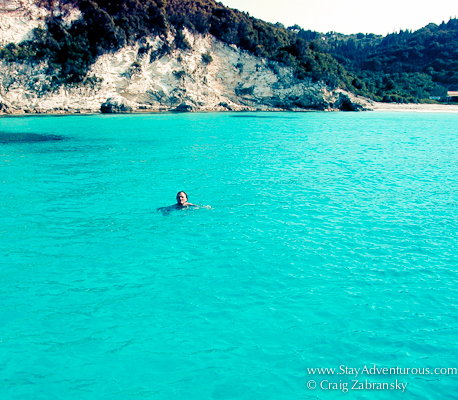 The Ionian Islands are much less crowded than others.. and much different. Definitely worth it. Honestly the place that made me fall in love with travel. Studied Modern Greek in Athens. And I love the picture of you swimming!